our hassle-free domain management platform. 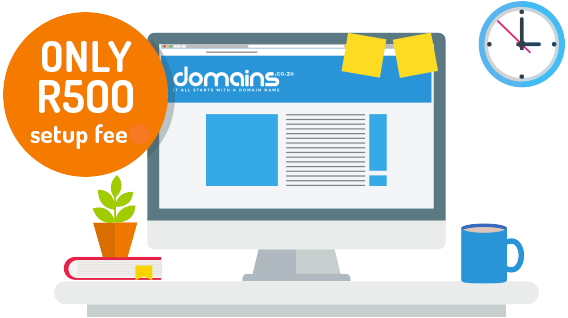 You can become a Domains Reseller quickly and easily and there no monthly fees. Use our custom built, white-labelled control panel to manage all aspects of your customers domains, from domain registrations and renewal to domain transfers and nameserver management. Make use of our free Premium DNS service if you do not have your own nameservers. We provide direct notifications from the registries regarding any action or pending action on your domains in the form of API Poll Messages or Email Notifications. These notifications include domain renewals, domain transfers, nameserver updates and registrant contact updates. As a Reseller there is no administrative or technical accreditation that is required to be completed, you can be up and running in a few minutes. As a domain Reseller you have almost identical features as a .co.za Registrar. Suspend and Unsuspend a domain name at the Registry. By suspending a domain name, all services that are associated with that particular domain name are disrupted. This includes email hosting, web hosting etc. Display the Domain and Registrant Contact status of a domain name when managing a domain in the Admin Area. View the last 10 historical events which have occurred on a domain name when managing the domain in the Admin Area. When managing a domain in the Admin area, we provide the facility to cancel an incoming domain transfer or a domain contact update. When a domain has been deleted from the Registry, our module allows you to have the domain automatically removed from WHMCS or have the domain name marked as Cancelled. Our module will allow you to specify a domain redemption fee for .co.za .org.za .net.za and .web.za domains. This fee will automatically be added to the customers outstanding domain renewal invoice when their domain enters redemption. Our module will remove any Unpaid domain renewal invoices when a domain gets deleted from the registry. This automated task ensures that your customer is not left with any unwanted Unpaid invoices for domains which no longer exist. Including the ability suppress notifications if the domain is marked as Cancelled. Our domains solution will also offers .joburg, .durban and .capetown as well as numerous other new gTLD’s. All communication done on the domains.co.za platform is done using 2048-Bit SSL Encryption. SSL Encryption and API IP Lockdown prevents unauthorized access to the API interface. Google Authenticator provides a 2-Step Verification on login to protect your account from hijacking by adding another layer of security. Comprehensive, Scalable and Secure API interface featuring more than 48 domain management functions. The domains.co.za platform is white-labelled and allows for notification and control panel branding. A WHMCS Registrar module and dashboard widget is available to Registrars & Resellers and a white-labelled version is also available. domains.co.za provides development assistance to Registrars and Resellers wishing to integrate into their own systems. domains.co.za has built up a strong working relationship with the various Registries and will liaise with them on behalf of Registrars. The domains.co.za platform provides the facility to automate the migration of legacy domains to EPP. domains.co.za is in constant contact with ZACR and international Registries in order to ensure that we are abreast of current and future developments. Easy to use, intuitive control panel makes domain administration a simple process through the use of bulk actions and Nameserver, Registrant templates. Registration, Transfer and Renewal Reports are all available through the domains.co.za Control Panel. Graphical statistics are provided for Domain Registrations, Renewals, Deletions, Transfers and Domain Expiries. Applicable to Resellers only - Resellers can add credits (funds) into their account as a real-time transaction by using our PayFast gateway. Why is there a R500 setup Fee? R250 is an administrative fee and R250 is automatically allocated to your Domains Reseller account and can be used for future registrations and renewals. Do you also support international domains? Yes, we support both local and international domains (.co.za, .com, .net, .biz, .org, .info, etc.) within the same control panel via our ICANN accreditation. There are no monthly costs, you ONLY pay when you actually register, *transfer and renew domains. * A Domains Reseller only pays R65 for a .co.za registration/renewal, transfers are free, international domains vary in price depending on the respective TLDs. Yes we do, We offer these domains at the lowest cost amoung all domain providers at *R150 incl vat. * This fee excludes premium domain names. Why use Domains.co.za as a Domain Reseller Provider? We are one of the only operation ICANN Accredited Registrar in South Africa and currently the largest ICANN Registrar in Africa. Some of the largest companies in South Africa look to us for solutions because of our expertise and extensive experience in the domain name industry.